Aaron Wilson’s debut feature film, Canopy, begins with a splendid but ominous shot of the lush forests of Singapore. From a place beyond several shades of densely packed greenery, thick clouds of smoke slowly rise to the sky. A caption informs us of the date: February 9th, 1942, when the Japanese powers defeated the Allied forces to occupy the island. As the island slowly reveals itself, the stillness begins to convey a sense of ghostliness lurking beneath the beauty of nature. This opening sets the tone for the rest of the film, a work of minimal, expressionistic storytelling whose unconventional dramatic beats inject fresh blood in the tired genre. The serenity of the atmosphere is broken when a soldier (Khan Chittenden) drops down on a tree with a parachute, bloodied and in a state of shock. We soon learn he is Australian, though further personal details are never openly explained. Trapped on the island, he’s on the run from the menace of Japanese soldiers whose conquests are visible throughout the land, and from the forest itself. Although he’s figuratively on the run, Canopy is devoid of conventional instruments of thrill, instead creating an atmosphere of suggestive threats with lights, shadows, and sounds. The hissing and rattling of insects and the dappled darkness of the night create what tension there is. Canopy and its protagonist meander their way through the Singaporean forest during the first half-hour. Our eyes adjust to the environment as the soldier does to its dangers. Cinematographer Stefan Duscio does a brilliant job of highlighting the atmosphere’s splendor. At certain times, the imagery feels overwhelming, shot in a way that attracts attention to the grandiosity of the photography rather than creating tension. Nevertheless, Duscio’s work carries the film through its many long wordless passages. There are countless frame-worthy compositions in a varied range of shots that truly bring out the best of the forest’s eerie beauty. The turning point in the narrative arrives in the form of a Chinese soldier (Tzu-Yi Mo), who finds himself similarly at the mercy of the Japanese. When the momentary conflict between the two soldiers subsides after they come face to face, a relationship begins to develop between them. Without the protagonists’ ability to communicate through words, Canopy suggests a blooming intimacy between the two men that grows beyond their common goal of survival, using gesture and moods. Wilson gets a lot of mileage from signifiers that veer dangerously close to clichés in other war films. Yet, without the tool of language, an exchange of pictures of their families between the two soldiers becomes an act of defiance and an expression of sheer force. 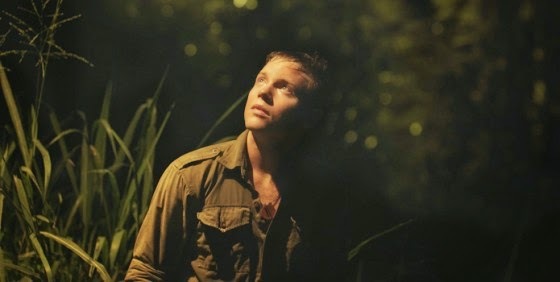 Canopy’s strongest scenes, then, are those in which Wilson uses the absence of dialogue to his advantage to paint impressionistic pictures of the familiar tropes of war cinema. Perhaps the most memorable of those is a sequence in which the two soldiers hide under the bushes as their armed Japanese counterparts pass them by. The sequence is presented almost entirely in close-ups, with each passing shadow on the young Australian man’s face implying another sigh of relief. Such tense setups are peppered throughout the film, before the only burst of action brings the story to its haunting, somehow unpredictable end. Despite running a tight 77 minutes, Canopy at times appears to be crumbling under the weight of its spare storyline. Yet the emotional punch of the finale is intensified precisely because of its incongruity in the trajectory of the narrative. That a first-time director can direct a film with such confidence, building a completely wordless narrative toward a crescendo of emotional force is an incredible achievement, and one that puts Wilson among the most promising debut directors of recent times.